The concept of sovereignty is a foundation of global politics. The countries that constitute the international system are supposedly defined by their ability to exercise supreme political authority over their entire territorial domains. But sovereignty in practice is often qualified, its limits varying as the context changes. This is particularly true in the United States. The problem of sovereignty in the U.S. dates back to the foundational debates over whether the new country would be a confederation of independent states or a single federal state. The ratification of the constitution established union, but the degree of national sovereignty remained contested through the early decades of the 1800s. People still spoke of the country in the plural (“the United States are …”), and the federal government remained miniscule, hardly a state at all to many European visitors. It was the Supreme Court’s 1819 decision in McCulloch v. Marylandthat first clearly limited the authority of state governments while granting constitutionally implied powers to Congress. South Carolina’s failure to nullify the federal tariff in 1832 further cemented federal authority, and the defeat of the Confederate States in the Civil War seemingly settled the matter for good. Yet the notion of state-level sovereignty never completely died, and today it is being revived. Nullification is again in their air as several state legislatures try to exempt their residents from the recent health-care bill. The concept of sovereignty is apparently in play, as voices call for the states to wrestle authority away from the federal government. According to the conservative website Right Side News, “the ‘State Sovereignty Movement’ continues to sweep the nation with well over three-quarters of the fifty states taking action, through their respective state legislatures, re-establishing their ‘sovereignty.’” Wyoming is the newest constitutionally sovereign state, after a bill was signed into law there on March 8, 2010. 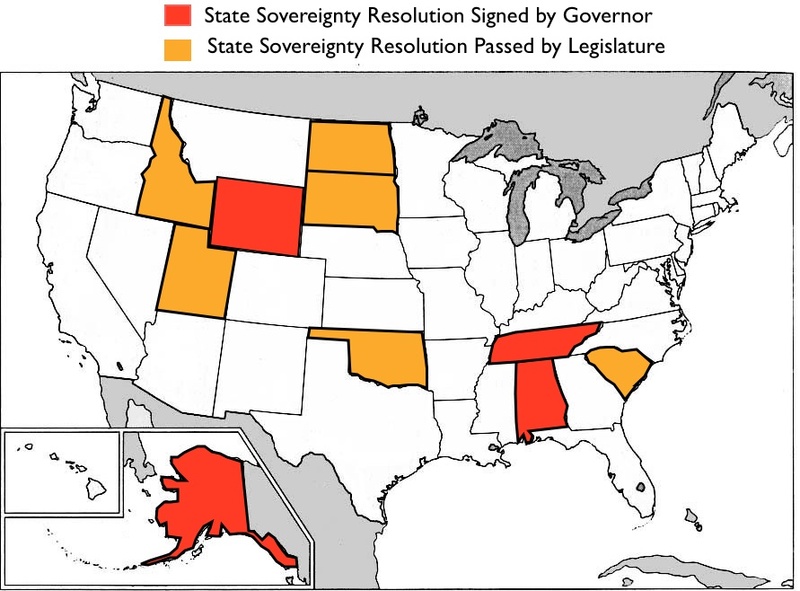 According to the Tenth Amendment Center, similar bills have been signed by governors in three other states, and have passed both branches of the legislature in an additional seven (see map). 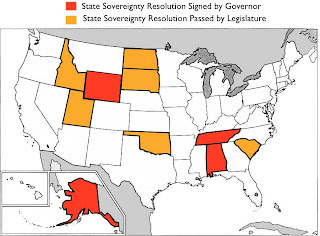 What the Wyoming legislature has claimed, however, is obviously not true “sovereignty” as the word is generally defined. The leaders of the sovereignty movement do not want states to be governed without federal interference of any kind, much less to chart their own foreign policies. What they are seeking is rather extensive autonomy. Their justification stems from a strict reading of the Tenth Amendment of the U.S. Constitution, which reserves to the constituent states all powers not explicitly granted to the federal government. And it is unlikely that Democratic Governor Dave Freudenthal of Wyoming wants even this limited form of sovereignty; a literal interpretation of the Tenth Amendment would shrivel the U.S. government to a fraction of its current size. Freudenthal, like many other proponents of “state sovereignty,” is likely more interested in making a symbolic statement in favor of states’ rights and against the further expansion of federal power. The term sovereignty has several meanings. It primarily denotes the authority at the top level of the geopolitical hierarchy: the territorial unit that accepts no higher power. But it can also refer to the powers vested in the highest-order spatial subdivisions of those units, which by definition accept a subordinate political status. This same slippage is evident in the term “state.” A state in standard political discourse is the entity that holds sovereignty: the governmental apparatus that exercises ultimate power. But in the U.S. and a few other countries, states are also the highest order spatial divisions of the state. The origin of such conceptual imprecision dates to the formation of the United States, when the leaders of the breakaway colonies disagreed about whether they should form a federation or a confederation. In the end a federal government was formed, but vestiges of the confederal age were deliberately retained, remaining fixed in our language and ever ready to be deployed in the perennial tussle between Washington and the states. The fifty United States, however, are not the only units in this country that claim sovereignty. The same is true of most Native American groups, as tomorrow’s post will explore.